Now that we are so close to the Samsung Galaxy Note 3 release date and official specs being revealed, it seems that fans are in two camps with some still speculating about what they want to see and others keeping away from rumors until the solid news arrives. There is a clear indication that users need and want specs that last longer than 12 months, which can be seen in some of the recent comments from those still mentioning their desires. The lifecycle between Samsung Galaxy Note 3 vs. 2 would be the normal yearly update, but a few Note 2 owners feel that the need to upgrade is pretty strong. One Phones Review reader stated, “I own the Galaxy Note 2 and love it, but I will upgrade if the rumors about specs are correct”. They continued, “How can you not want a Galaxy Note 3 with a Snapdragon 800, Gorilla Glass 4, SD card support, a huge battery, and possibly wireless charging”. Excitement for Samsung’s Galaxy Note 3 is at an all time high after we saw rumors pointing to a launch event. This sets a press conference for September 4th, although it is good to remember this is also speculation and rumor delivered from insiders in Korea. Samsung Galaxy Note 3 faith in specs longevity — the number of Note 2 owners demanding specs that last a lot longer than 12 months can also be seen in feedback we’ve received. Users want a Galaxy Note 3 that performs better in the sun, so the screens are easy to read. One of our readers stated, “This will be the smartphone that lasts for more than 1 year, and we are getting close to the time when your phone won’t need to be replaced constantly”. Another commenter said, “I own the Note 2 but after seeing all the specs rumored for Galaxy Note 3 it makes me feel like my current smartphone is very old. I only purchased this phone 9 months ago, I really hope Samsung include a lot of the features we have heard about Galaxy Note 3 so it lasts a lot longer”. We would love to hear from our readers in regard to what Galaxy Note 3 specs would last you longer than one year? Are there certain features that need to be included, so you wouldn’t need an upgrade for at least 2 years? Then you want a Galaxy Mega. 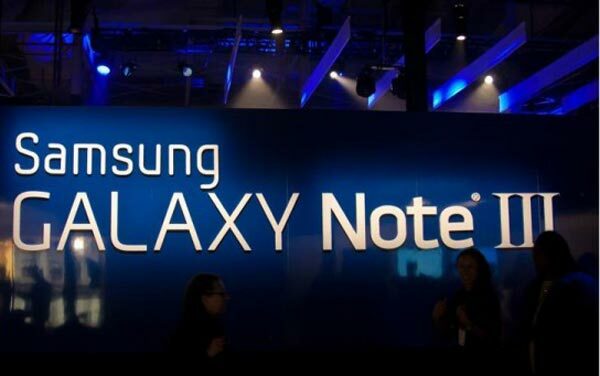 It is unlikely that the Galaxy Note 3 will feature a screen larger than 6″ despite being the founding father of the phablet category. The problem is the note will go to all carriers where the mega won’t. I would also suggest the sony z ultra with 6.4…but then again I think that will only be on t mobile…the note is the only carrier universal phablet…I would go for the sony with 6.4 but the round design on the note makes me weary of the 6.3 but if its square like some of the cases Samsung had been using (but most likely just to hide identity) I think I would feel better about 6.3…but then again I dont think the bump to 5.7 is incremental enough. Don’t forget that’s a 5.7″ Super AMOLED 1080p screen. It will not only have a high ppi but also look as amazing as the Galaxy S4 does in direct sun light. suggested. And have a Carbon Fiber back batt cover, since Sam purchased 50% of a major Carbon Fiber Co. n July.HooRaw.! I would be happy with a 6″ screen but for sure not a 5.7″ Samsung is missing the point here if they go with such a small screen (you know what I mean) when the competition is going much bigger when it was the size what first made the Note popular. So why give away your claim to fame feature now? Just a dumb move. Would be better to have multiple size options..and now the BS Mega is not an option..we want a high end phone not that junk. Being a Galaxy Note 2 owner has been the best thing ever. I definitely look forward to the Galaxy Note 3 on launch day for Tmobile. Not to many current Note 2 owners will be missing the Note 3 bank on that. I can’t wait for the official announcement of the Note 3. As a Note 2 owner it’s going to be extremely interesting to see how Samsung has improved on an already incredible phone. Obviously they can and will upgrade the processor and display but in the real world, people won’t really see a marked improvement in the speed of it all. I can honestly say my Note 2 has chewed up and spat out everything I’ve thrown at it. Without even blinking or should I say stuttering. Well done to Samsung and Google of course, on that. What is really going to be important to me is the overall feeling you get from the device, and on that I’ll bet everything that Samsung won’t disappoint us. Sorry Galaxy Note 2 users…I’m on the first gen Galaxy Note and I already had to deal with the many months of agony of wanting the Note 2 with it’s upgraded specs. My Note 1 has already showed it’s age after upgrading to Jelly Bean by taking more time to boot up / slower startup of apps / S Note degradation in performance. If I had the Galaxy Note 2, perhaps all of these issues would be irrelevant. The fact is that there are two processors each with 4 cores. it is the Big little feature. 4 cores for heavy apps and 4 for lighter. it is for managing your battery. Nevertless to say it will be a great phone i am waiting with anticipation to come as it will be my first smartphone. I am ashamed to say that but my job till now required a Samsung Solid phone and it did very well till now. Appologies are not needed. I have two lines, my personal line has the Galaxy Note 2 and my business line has the Galaxy Note which doubles as a car Cam. To date, I have saved myself from being falsely faulted at an accident and I have recorded amazing things at 1080p. Now that 4k or UltraHD is here, We can look forward to amazingly high ppi on phablet screens with cameras striving to aapture at those resolutions. A few things you may have missed that are up and coming for Samsung Tech: Flexible OLED screens, ultraHD, 128GB Mobile SSD, 6GB RAM modules, improved WACOM technology and Samsung Gear (a watch-like device synchronized to your Galaxy device capable of displaying your text messages, taking your calls and taking control of your music player. I have the original note, so the gap in terms of technology will have leapfrogged from note 1 to note 3 and I think by missing the note 2 ( I was in a 2 year contract) I will appreciate it even more than you guys who already have a note 2. However the note 1 is still a very good phone now even though it’s almost 2 years old. It’s running Jellybean reasonably well and I don’t mind using it until October, when my contract is over. I can’t wait to compare the 2 beside each other. Note 2 users won’t see as big a difference. 5.7 inch does not feel right for me…I will wait and see if Samsung has a change in its thinking and brings out a larger sized Note 3 or 3.1…Or I will settle for a Note 12.2 this year and use the Note 2 for one more year.Ideally Samsung needs to actually bring out two or even three Note 3 versions .If they really care about all the different preferences amongst the consumers…It will cost Samsung a bit extra ..but ideally it needs to keep the millions of customers happy around the globe…. I have the S4 and think its pretty close to perfect however I would prefer the Note 3’s larger display, battery, RAM and more powerful processor. So i’ll most likely be buying it. This will probably be costly, so please make last a bit longer than a year. Plan to buy and expect it to be viable for three years.